This week Awesome Stories brings you bold values, inner teachers, better nursing homes, and forest cities. Kudos to REI for living their values in an audacious way. In 2015, REI made the bold decision to close on Black Friday, the biggest day of the year for most retailers. They closed their stores and distribution centers, paid their employees, and encouraged them to spend the day outside with the tag #OptOutside. Their risky move paid off in every way with 1.4 million people responding to the campaign, along with 175 other organizations who joined the challenge. Ultimately REI increased sales and profits for the year by putting values and purpose at the forefront of their business. May more companies put people and planet above profits, helping to change the world for the better. Ursula K. Le Guin explores her views on life, words, meaning, and art in her latest book; Words Are My Matter. I haven’t read the book, but I like her idea of good writing as a jumping off point for meaning. They are best when they leave room for interpretation and exploration to find the meaning beyond the message. She tries to avoid writing messages as truth, but rather leaving space for people to find their own truth in her words and stories. She believes art is co-created by the artist and audience revealing something beyond the message. I hope my writing and teaching leave similar room for people to find their own truth. I believe we find our own truth by listening to our inner teacher, experimenting, and paying attention to what works and doesn’t. Reform is badly needed in the nursing home industry. After seeing how much his mother aged in just a few days at the nursing home he managed, Barry Berman embarked on a mission to improve nursing homes around the country. He helped create The Leonard Florence Center for Living based on a new approach to elder care called Green House Project that focuses on smaller numbers of residents with more input on their daily food, care, and quality of life. The homes are more residential with 10 -12 private bedrooms with baths clustered around a central living room and dining area. They also feature person-centered care and empowered teams of staff where both residents and staff are generally happier. The bigger challenge is how to apply the principals and aesthetics of Green Homes to the 16,000 nursing homes around the country that house 1.5 million people needing places to live, with that number growing steadily as the US population ages. China has started construction on what will be the world’s first “forest city” with 1 million plants and 40,000 trees. The futuristic city in Liuzhou, Guangxi Province will be a model of sustainability to fight climate change, running on renewable energy, fully wired, and connected to regional cities by electric cars and trains. Besides emitting oxygen and absorbing oxygen, the plants and trees will help keep the city cooler, quieter, healthier, and improve regional biodiversity. Hopefully, this will become the design standard for cities around the world. May we work together to create enlightened cities and business that care for people and planet. Great point about leaving room to find our own truth. Brings back annoying memories of high school AP lit courses where our job was to identify and communicate the “right” message the author was trying to convey. I’ve returned to several of these classical texts and found them FAR more enjoyable absent the need to fit my experience into the correct box. ❤ Good stuff here, my friend. Thanks Annette. Have a beautiful week! Great ideas! Do want to read Le Guin’s book! We need to take better care of our old ones – glad to see good minds are thinking in that direction.. Agreed Diane. Thanks for caring. Keep up the good work, Brad! I can share from experience that having a lot of trees, as in the forest city, does keep things cooler, quieter, healthier, and improves biodiversity. Agreed JoAnna. I would much rather live in a forest city and hope that becomes the design standard for all future cities. May we live in harmony with nature and each other. This weeks awesome stories tell of accomplishments that some might have thought impossible. The forest city project give me hope. You are most welcome! There’s hope for us, yet! A wonderful round up of stories this week again. I love the link in the Inner Teacher by Ursula. Certainly something to ponder as a blogger. We also need some reform here re- nursing homes. Both my parents were in one so it seems to be a far reaching issue. Thanks Di. I’m still learning to pay attention, listen and discern my inner teacher. Maybe one day I’ll master the skill. 🙂 Yes, how we care for our increasing elderly populations is so important. Meanwhile, having friends to share the journey brings me joy. Thank you. I think to listen to our inner teacher is a lifetime journey and part of the fun of personal evolution I believe. I have a 93 year old friend who is as sharp as anything, who reads the Wayne Dyer, Tolle books etc… and I asked her why she still reads them (for pure advice not because I didn’t think she should…) and she simply said ‘well, you never stop learning do you?’ I loved it! Hi Brad.. 🙂 lovely to be catching up again with you my friend.. 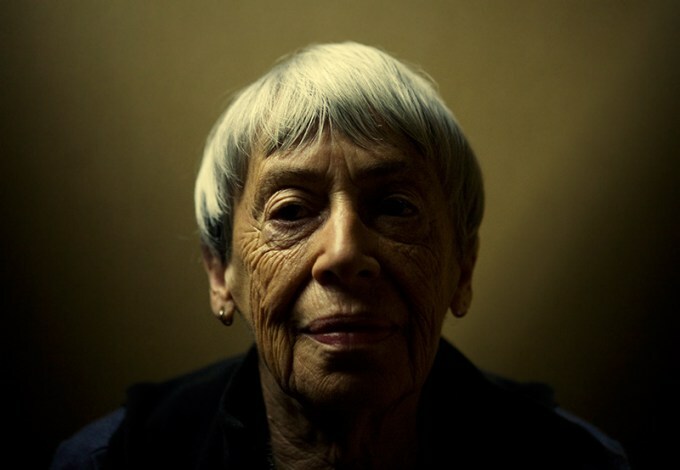 I have not heard of Ursula K. Le Guin, but love how you describe her writing as leaving room for people to find their own space to find the truth within her words.. Love that..
And it goes without saying we all want better care for the elderly here in the UK they are not getting a great reputation either.. With many falling short of good Quality Care.. .. I also love the Forest Gardens.. Very futuristic looking.. I saw a programme about China the other week on TV showing some high rise towers with sort of hanging garden bridges between.. Out of this world it looked.. Just amazing..
Hope all is well with you also Brad.. The forest city would seem to be a great place to live and I hope that the rest of the world invests as much in green solutions. I’ve recently started to think about the fact that our 24/7 world means that people don’t get the time off as a community the way they used to, so good for REI for trying to make a little dent in that culture. Agreed Andrea. We need time off and nature. I love your commitment to ecology and peace, Brad. Thanks Genie. I’m happy to share the journey with you. A forest 🌳 🌳🌳 city plan is very encouraging! Thank you for sharing these awesome stories, Brad! Again, great articles…didn’t know that about REI…how cool is that!! love it! Nursing Homes…that is a real issue and will continue to be even more as the baby boomers continue aging…love the forest city…brilliant idea and yet so simple. Thanks Kirt. It’s good to see progress on these challenges.